Carissa opaca leaves are traditionally used in the treatment of male dysfunction and hormonal disorder as well as in oxidative stress in Pakistan and Asia. The present study was designed to assess the protective effects of methanolic extract of Carissa opaca leaves (MLC) on carbon tetrachloride (CCl4)-induced reproductive stress in male rats and bioactive constituents responsible for the activity. CCl4 was induced in 42 male rats for eight weeks and checked the protective efficacy of methanolic extract of Carissa opaca leaves at various hormonal imbalances, alteration of antioxidant enzymes, DNA fragmentation levels and lipid peroxidation caused testicular fibrosis in testis while High performance Liquid Chromatography (HPLC) was used for detection of bioactive components. 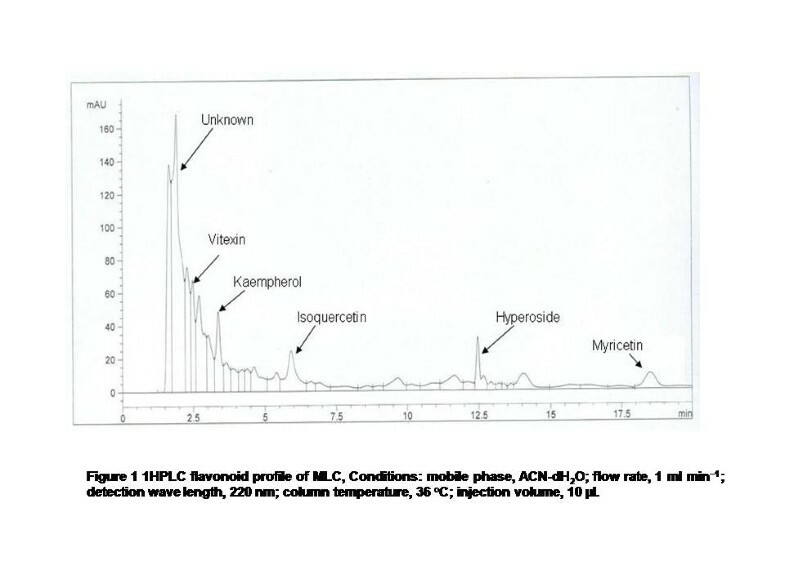 HPLC characterization revealed the presence of isoquercitin , hyperoside , vitexin , myricetin and kaempherol. CCl4 caused significant alteration in the secretion of reproductive hormones. Activity of antioxidant enzymes viz; catalase, superoxide dimutase and phase II metabolizing enzymes including glutathione peroxidase, glutathione reductase and reduced glutathione was decreased while DNA fragmentation, hydrogen per oxide contents and thiobarbituric acid reactive substances (TBARS) were increased with CCl4 treatment. Co-administration of 100 mg/kg and 200 mg/kg b.w. MLC effectively ameliorated the alterations in the biochemical markers; hormonal and molecular levels. Protective effects of methanolic extract of Carissa opaca against CCl4−induced antioxidant and hormonal dysfunction which might be due to bioactive compound present in extract. During the last decade, considerable attention was given to the involvement of oxygen free radicals in various diseases. There is no doubt that reactive oxygen species (ROS) play an important role in pathological changes in the liver, particularly in the case of alcoholic and toxic liver diseases . Biological membranes are particularly prone to ROS effect. The peroxidation of unsaturated fatty acids in biological membranes leads to the decrease of membrane fluidity and the disruption of membrane integrity and function. Such peroxidation effect is implicated in serious pathological changes . CCl4 is an industrial solvent causes tissue damages in various tissues of experimental animals. CCl4 requires bioactivation by phase I cytochrome P450 system to form reactive metabolic radicals. These free radicals can bind with polyunsaturated fatty acid (PUFA) of sperm membrane to generate lipid peroxides that are highly reactive, change enzyme activity and finally induce injury or necrosis [3, 4]. Several endogenous protective mechanisms have evolved to limit ROS effect and the damage caused by them . However, when this protection is not complete, or when the formation of ROS is excessive, additional protective mechanisms of dietary antioxidants may be of a great importance. Therefore, many natural and synthetic agents possessing antioxidative properties have been proposed to prevent and treat infertility and reproductive hormonal imbalance induced by oxidative stress . There is increasing evidence of the protective role of hydroxy and polyhydroxy organic compounds, particularly from vegetables, fruits and some herbs. Plants are well-known excellent perspectives for the discovery of new therapeutical products. In recent years, an ample interest has been developed in finding natural antioxidants from commonly available wild plants, fruits and vegetables that were generally mistreated [7, 8] as well as an important role in detoxification of free radicals induced lung injuries and fibrosis in experimental animal’s model. Carissa opaca Stapf ex Hanes a 2–3 meter tall evergreen shrub containing glabrous fruits widely found in Pakistan . Traditionally this plant is used for the treatment of asthma , hepatitis , diarrhea  and renal dysfunction . The present study was conducted to examine the toxic upshots of CCl4 plus to compare the beneficial effects of plant extracts on reproductive hormonal disturbance and activity of antioxidant enzymes in various experimental groups. In this respect, several parameters regarding the testicular injury and fibrosis were studied. C. opaca leaves were collected in March 2011 from the Quaid-i-Azam University Islamabad, Pakistan, recognized by their local names and validated by Dr. Mir Ajab Khan, Department of Plant Sciences, Quaid-i-Azam University, Islamabad. A voucher specimen was deposited at the Herbarium of Pakistan Quaid-i-Azam University, Islamabad Pakistan for future reference. The collected plant leaves were cleaned and dried under shade for fifteen days. Willy Mill of 60-mesh size was used to prepare powder of dried samples and then 5 kg powdered plant sample was extracted twice with 10 L of 95% methanol at 25°C for 48 h. For filtration Whatman No. 1 filter paper was used and then filtrate was concentrated on rotary evaporator (Panchun Scientific Co., Kaohsiung, Taiwan) under reduced pressure at 40°C and dry extract was stored at 4°C for further in vivo investigation. 50 mg of fine powder was extracted with 6 ml of 25% hydrochloric acid and 20 ml methanol for 1 h. The obtained extract was filtered to a volumetric flask and diluted to 100 ml with methanol. 10 μl was injected into HPLC column (20RBAX ECLIPSE, XDB-C18, 5 μm; 4.6 × 150 mm, Agilent USA) with UV–VIS Spectra-Focus detector, injector-auto sampler. Solvent A (0.05% trifluoroacetic acid) and solvent B (0.038% trifluoroacetic acid in 83% acetonitrile (v/v) with the following gradient: 0–5 min, 15% B in A, 5–10 min, 70% B in A, 10–15 min, 70% B in A. The flow rate was 1 ml/min and injection volume was 10 μl. Various standard compounds including rutin, myricetin, vitexin, orientin, hyperoside, isovitexin, isoquercetin, luteolin, apigenin, kaempherol, and luteolin-7-glucoside were run for comparative detection and optimized. The calibration curves were defined for each compound in the range of sample quantity 0.02-0.5 μg. All samples were assayed in triplicate. Six-week-old male Sprague Dawley rats weighing 180 ± 10 g were provided with food and water ad libitum and kept at 20–22°C on a 12-h light–dark cycle. All experimental procedures involving animals were conducted in accordance with the guidelines of National Institutes of Health (NIH guidelines). The study protocol were approved by Ethical committee of Quaid-i-Azam University Islamabad. The rats were acclimatized to laboratory condition for 7 days before commencement of experiment. For chronic toxicity eight week experiment was designed. 42 male albino rats were randomly divided into seven groups (6 rats of each group). Administration of CCl4 (0.5 ml/kg b.w., 20% CCl4/olive oil) was intraperitoneally (i.p.) twice a week for eight weeks. At the same time, the rats were administered individually silymarin (50 mg/kg b.w.) and extract (100, 200 mg/kg b.w.) orally twice a week for eight weeks. Following dosing plan was adapted for the study. At the end of eight weeks, after 24 h of the last treatment, Urine was collected and stored at −70°C for further analysis, and then animals were given chloroform anesthesia and dissected from ventral side. All the animals were sacrificed; blood was drawn prior to the excision of organ tissues. The serum was stored at −80°C after separation until it was assayed as described below. After taking blood the testis were removed and washed in ice cold saline. Subsequently, half of the organs were treated with liquid nitrogen and stored at −80°C for further enzymatic and DNA damage analysis while the other portion was processed for histology. Serum analysis of testicular hormones like FSH, LH, testosterone, prolactin and esteradiol were radioimmunoassayed by using Marseille Cedax 9 France Kits and Czch Republic Kits from Immunotech Company. Then again, lipid profile such as Triglycerides, total cholesterol, LDL and LDH waere estimated by using standard AMP diagnostic kits (Stattogger Strasse 31b 8045 Graz, Austria). 10% homogenate of tissue was prepared in 100 mM KH2PO4 buffer containing 1 mM EDTA (pH 7.4) and centrifuged at 12,000 × g for 30 min at 4°C. The supernatant was collected and used for the following parameters as described below. CAT activities were determined by the method of Chance and Maehly  with some modifications. The reaction solution of CAT activities contained: 2.5 ml of 50 mM phosphate buffer (pH 5.0), 0.4 ml of 5.9 mM H2O2 and 0.1 ml enzyme extract. Changes in absorbance of the reaction solution at 240 nm were determined after one minute. One unit of CAT activity was defined as an absorbance change of 0.01 as units/min. Activities of POD were determined by the method of Chance and Maehly  with some modifications. The POD reaction solution contained: 2.5 ml of 50 mM phosphate buffer (pH 5.0), 0.1 ml of 20 mM guaiacol, 0.3 ml of 40 mM H2O2 and 0.1 ml enzyme extract. Changes in absorbance of the reaction solution at 470 nm were determined after one minute. One unit of POD activity was defined as an absorbance change of 0.01 units/min. SOD activity was estimated by the method of Kakkar et al. . Reaction mixture of this method contained: 0.1 ml of phenazine methosulphate (186 μM), 1.2 ml of sodium pyrophosphate buffer (0.052 mM; pH 7.0), 0.3 ml of supernatant after centrifugation (1500 × g for 10 min followed by 10000 × g for 15 min) of testis homogenate was added to the reaction mixture. Enzyme reaction was initiated by adding 0.2 ml of NADH (780 μM) and stopped after 1 min by adding 1 ml of glacial acetic acid. Amount of chromogen formed was measured by recording color intensity at 560 nm. Results are expressed in units/mg protein. Glutathione-S-transferase activity was assayed by the method of Habig et al. . The reaction mixture consisted of 1.475 ml phosphate buffer (0.1 mol, pH 6.5), 0.2 ml reduced glutathione (1 mM), 0.025 ml (CDNB) (1 mM) and 0.3 ml of homogenate in a total volume of 2.0 ml. The changes in the absorbance were recorded at 340 nm and enzymes activity was calculated as nM CDNB conjugate formed/min/mg protein using a molar extinction coefficient of 9.6 × 103 M-1cm-1. Glutathione reductase activity was determined by method of Carlberg and Mannervik . The reaction mixture consisted of 1.65 ml phosphate buffer: (0.1 mol; pH 7.6), 0.1 ml EDTA (0.5 mM), 0.05 ml oxidized glutathione (1 mM), 0.1 ml NADPH (0.1 mmol) and 0.1 ml of homogenate in a total volume of 2 ml. Enzyme activity was quantitated at 25°C by measuring disappearance of NADPH at 340 nm and was calculated as nM NADPH oxidized/min/mg protein using molar extinction coefficient of 6.22 × 103 M-1cm-1. Glutathione peroxidase activity was assayed by the method of Mohandas et al. . The reaction mixture consisted of 1.49 ml phosphate buffer (0.1 M; pH 7.4), 0.1 ml EDTA (1 mM), 0.1 ml sodium azide (1 mM), 0.05 ml glutathione reductase (1 IU/ml), 0.05 ml GSH (1 mM), 0.1 ml NADPH (0.2 mM), 0.01 ml H2O2 (0.25 mM) and 0.1 ml of homogenate in a total volume of 2 ml. The disappearance of NADPH at 340 nm was recorded at 25°C. Enzyme activity was calculated as nM NADPH oxidized/min/mg protein using molar extinction coefficient of 6.22 × 103 M-1cm-1. The activity of quinone reductase was determined by the method of Benson et al. . The 3.0 ml reaction mixture consisted of 2.13 ml Tris–HCl buffer (25 mM; pH 7.4), 0.7 ml BSA, 0.1 ml FAD, 0.02 ml NADPH (0.1 mM), and 0.l ml of homogenate. The reduction of dichlorophenolindophenol (DCPIP) was recorded at 600 nm and enzyme activity was calculated as nM of DCPIP reduced/min/mg protein using molar extinction coefficient of 2.1 × 104 M-1cm-1. Reduced glutathione was estimated by the method of Jollow et al. . 1.0 ml sample of homogenate was precipitated with 1.0 ml of (4%) sulfosalicylic acid. The samples were kept at 4°C for 1 h and then centrifuged at 1200 × g for 20 min at 4°C. The total volume of 3.0 ml assay mixture contained 0.1 ml filtered aliquot, 2.7 ml phosphate buffer (0.1 M; pH 7.4) and 0.2 ml DTNB (100 mM). The yellow color developed was read immediately at 412 nm on a SmartSpecTM plus Spectrophotometer. It was expressed as μM GSH/g tissue. The assay for lipid peroxidation was carried out following the modified method of Iqbal et al. . The reaction mixture in a total volume of 1.0 ml contained 0.58 ml phosphate buffer (0.1 M; pH 7.4), 0.2 ml homogenate sample, 0.2 ml ascorbic acid (100 mM), and 0.02 ml ferric chloride (100 mM). The reaction mixture was incubated at 37°C in a shaking water bath for 1 h. The reaction was stopped by addition of 1.0 ml 10% trichloroacetic acid. Following addition of 1.0 ml 0.67% thiobarbituric acid, all the tubes were placed in boiling water bath for 20 min and then shifted to crushed ice-bath before centrifuging at 2500 × g for 10 min. The amount of TBARS formed in each of the samples was assessed by measuring optical density of the supernatant at 535 nm using spectrophotometer against a reagent blank. The results were expressed as nM TBARS/min/mg tissue at 37°C using molar extinction coefficient of 1.56 × 105 M-1cm-1. Hydrogen peroxide (H2O2) was assayed by H2O2-mediated horseradish peroxidase-dependent oxidation of phenol red by the method of Pick and Keisari . 2.0 ml of homogenate sample was suspended in 1.0 ml of solution containing phenol red (0.28 nM), horse radish peroxidase (8.5 units), dextrose (5.5 nM) and phosphate buffer (0.05 M; pH 7.0) and were incubated at 37°C for 60 min. The reaction was stopped by the addition of 0.01 ml of NaOH (10 N) and then centrifuged at 800 × g for 5 min. The absorbance of the supernatant was recorded at 610 nm against a reagent blank. The quantity of H2O2 produced was expressed as nM H2O2/min/mg tissue based on the standard curve of H2O2 oxidized phenol red. DNA had been isolated and its fragmentation percent was quantified in molecular studies of in vivo toxicity. DNA fragmentation from tissue extract was determined using the procedure of Wu et al. . 100 mg tissue was homogenized in TTE solution. 0.1 ml of homogenate was labeled B, centrifuged at 200 × g at 4°C for 10 min, got supernatant labeled S. S tubes were centrifuged at 20,000 × g for 10 min at 4°C to separate intact chromatin, was labeled T. 1.0 ml of 25% TCA was added in all tubes T, B, S and incubated over night at 4°C. After incubation precipitated DNA was recovered by pelleting for 10 min at 18,000 × g at 4°C. 160 μl of 5% TCA was added to each pellet and heated for 15 min at 90°C then 320 μl of freshly prepared DPA solution was added, vortexed and incubated for 4 hr 37°C. Optical density was read at 600 nm with a spectrophotometer (Smart spec™ Plus, catalog # 170–2525). DNA was isolated by using the methods of Wu et al.. 100 mg of tissue in a petri dish was washed with DNA Buffer and homogenized in 1 ml lysis buffer. 100 μl of proteinase K (10 mg/ml) and 240 μl 10% SDS, shaked gently, and incubate overnight at 45°C in a water bath then 0.4 ml of phenol, was added shaked for 5–10 min, and centrifuge at 3000 rpm for 5 min at 10°C. Supernatant was mixed with 1.2 ml phenol, 1.2 ml Chloroform/isoamyl alcohol (24:1); shaked for 5–10 min, and centrifuged at 3000 rpm for 5 min at 10°C. 25 μl of 3 M sodium acetate (pH 5.2) and 5 ml ethanol was added with supernatant, shake until DNA was precipitated. DNA was washed with 70% ethanol, dried, dissolved in TE buffer and its concentration checked at 260 and 280 nm. 5 μg of total DNA and 0.5 μg DNA standard per well were loaded on 1.5% agarose gel containing ethidium bromide. Electrophoresis was performed for 45 min with 100 V batteries, and DNA was observed under digital gel doc system and photographed. After weighting the portion specifies for histology small pieces of each tissue was fixed for 3–4 h in fixative sera followed by dehydration with ascending grades of alcohol (80%, 90%, and 100%) and transferred in cedar wood oil. When tissue becomes clear then all tissues were embedded in paraplast and prepared blocks for further microtomy. 3–4 μm thin slides were prepared with microtome; wax was removed, stained with hemotoxilin-eosin and photographed under light microscope at 10x and 40x. To find the different treatment effects of in vivo studies one way analysis of variance was carried by computer software SPSS 13.0. Level of significance among the various treatments was determined by LSD at 0.05% level of probability. In the present study, HPLC-UV was preferred for the qualitative as well as quantitative analysis of methanolic extract of C. opaca leaves. All experimental conditions were optimized to get the chromatograms with better resolution within a short resolution time and maximum UV absorption of sample and flavonoid standard compounds were quantified by assimilation of peak areas at 220 nm within runtime of 20 minutes as summarized in Table 1. The conditions used directed towards the good separation of peaks that may be identified in the chromatogram as apigenin (Rt =4.7), myricetin (Rt =18.5), vitexin (Rt =2.5), orientin (Rt =2.75), hyperoside (Rt =12.5), isovitexin (Rt =3.7), isoquercetin (Rt =6), rutin (Rt =8.7), luteolin (Rt =2.01), kaempherol (Rt =3.4), luteolin-7-glucoside (Rt =1.6). A sample of 10 μl of solution was injected to the instrument and identification was done by comparing the obtained peaks of chromatogram of samples with the peaks of standard flavonoids in respect to retention time and UV-spectra. The chromatogram determining flavonoids components of different fractions of C. opaca leaves in Figure 1. Table 2 summarized the flavonoids found in methanolic fraction of C. opaca leaves. There were some peaks having different retention time could not be identified; however, based on their chromatographic behaviors and UV spectra, they may correspond to unknown flavonoids compounds as presented in respective chromatogram. Values are Mean ± SD (03 number). 1HPLC flavonoid profile of MLC, Conditions: mobile phase, ACN-dH 2 O; flow rate, 1 ml min −1 ; detection wave length, 220 nm; column temperature, 36°C; injection volume, 10 μl. Previous studies reported that liver is not the just target organ of CCl4; it can actually distress other vital organs including kidney, lungs, heart and testis. Consequently, the intention of the current study was to assess the CCl4 as one of the male reproductive toxicant, hence alteration in the male reproductive hormones, antioxidant levels, lipid profile of serum and histopathological changes of the testis were investigated. The current study was paying attention on the estimation of ameliorating potential of C. opaca leaves against testicular toxicity provoked by CCl4. The biomarkers for testicular toxicity evaluation were based on serological studies, antioxidant enzyme levels of tissue, genotoxicity and histological variation of testis. Data from the serological markers for reproductive status such as testosterone, luteinizing hormone (LH), follicle stimulating hormone (FSH), prolactin and estradiol is summarized in Table 3. CCl4 intoxication drastically (p < 0.05) reduced the serum level of testosterone, LH and FSH, while notably (p < 0.05) increased the intensity of prolactin and estradiol. The serum level of above said reproductive hormones was re-established (p < 0.05) by oral administration of 100 mg/kg b.w., 200 mg/kg b.w., MLC near to control group. 50 mg/kg body weight of silymarin treatment erased CCl4 intoxication and restored the level of all tested reproductive hormones in serum of rats. Values are Mean ± SD (06 number), Sily = Silymarin. a-f (Means with different letters) indicate significance at p < 0.05. Table 4 summarizes protective effects of MLC against CCl4 induced toxicity in lipids profile of serum. For lipid parameters total triglycerides, total cholesterol, HDL, and LDL were investigated.CCl4 disputation markedly increased the levels of triglycerides, total cholesterol, and LDL cholesterol while decreased (p < 0.01) HDL cholesterol as against the control group. Treatment of MCL cancelled the toxicity of CCl4 thus, restoring the serum level of total triglycerides, total cholesterol, HDL, and LDL towards the control group. Treatment with silymarin also produced similar results. Values are Mean ± SD (06 number). Sily = Silymarin. a-e (Means with different letters) indicate significance at p < 0.05. Oxidative stress produced by CCl4 upsets the cellular antioxidant defense system. The protective effects of MLC against CCl4 toxicity on the antioxidant profile are presented in Table 5. Administration of CCl4 for eight weeks caused noteworthy (p < 0.05) decrease in the tissue soluble protein and CAT, POD and SOD activities as opposite to control group. Post-treatment of 100 mg/kg b.w., 200 mg/kg b.w., MLC markedly ameliorated the affects of CCl4 intoxication, and distinctly enhanced (p < 0.05) testicular protein and CAT, POD and SOD levels of testicular tissue. Lipid peroxidation is umpired via free radicals produced by CCl4 intoxication. The significant decline in H2O2 and TBARS level of testicular tissue corroborates with protective power 100 mg/kg b.w., 200 mg/kg b.w., MLC against testicular CCl4 induced lipid peroxidation in testis tissue. Similar protective effects were reported, while treating with silymarin. a-h (Means with different letters) indicate significance at p < 0.05. Alterations in phase II antioxidant metabolizing enzymes viz; GST, GPx, GR, GSH and QR as well as DNA fragmentation% testicular tissues of rat are demonstrated in Table 6. Chronic administration of CCl4, extensively (p < 0.05) abridged the glutathione status of GST, GPx, GR, GSH and QR whereas, percentage of DNA fragmentation was increased in comparison to non treated control group. Post-treatment with 100 mg/kg b.w., 200 mg/kg b.w., MLC attenuated the intoxication of CCl4 and restored the enzymes activity near to control rats. Silymarin treatment markedly lessened the DNA fragmentation% while, increased the GST, GSH, GR, GPx and QR activation similar to the effects of 100 mg/kg b.w., 200 mg/kg b.w., MLC. Protective effects of different doses of MLC versus CCl4 induced DNA damage in the testicular tissues of rats is shown by DNA ladder assay in Figure 2. Extensive DNA breakages in testis were portrayed by the treatment of CCl4 to rats. Post-administration of silymarin and MLC prevented the DNA damages induced by CCl4 indicating the protective effects of C. opaca leave. 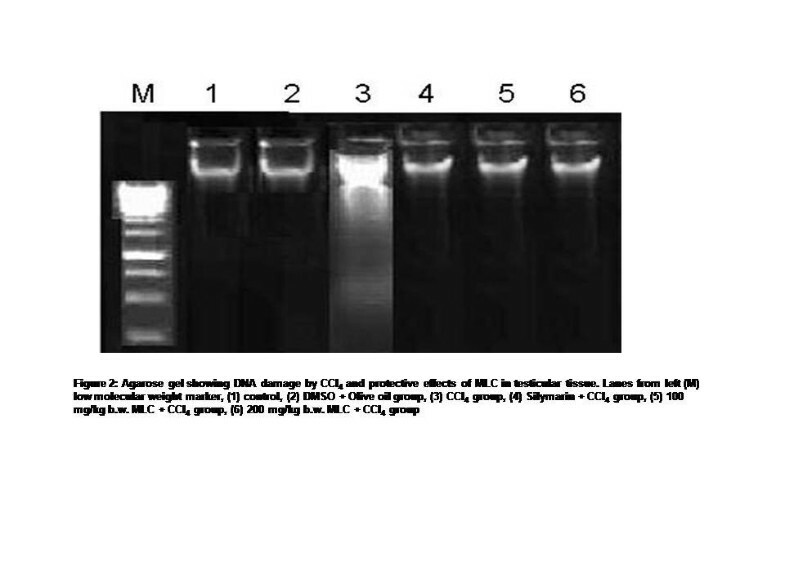 Agarose gel showing DNA damage by CCl 4 and protective effects of MLC in testicular tissue. Lanes from left (M) low molecular weight marker, (1) control, (2) DMSO + Olive oil group, (3) CCl4 group, (4) Silymarin + CCl4 group, (5) 100 mg/kg b.w. MLC + CCl4 group, (6) 200 mg/kg b.w. MLC + CCl4 group. The histoarchitecture of testis after different treatments is presented in Figure 3. Light microscope evaluation of H & E stain showed normal testicular architecture possessing normal seminiferous tubules, normal concentration of germ cells, sperms with normal morphology and concentration and inconspicuous sertoli cells (Figure 3A). The CCl4 intoxication resulted in ruthless testicular injuries with imperative decrease in germ cells, vacuolization of germinative epithelium and dislocated interstitial cells away from basement membrane and seminiferous tubules as shown in Figure 3B. The silymarin group also showed almost normal structure of testis as compare to CCl4 intoxicated group (Figure 3C). Groups treated MLC showed improved concentration of sperms and stabilization of organized seminiferous tubules (Figure 3D). The results obtained from histological architecture were in consistency with the hormonal studies as well as antioxidant status. Microphotograph of rat testis (H & E stain). 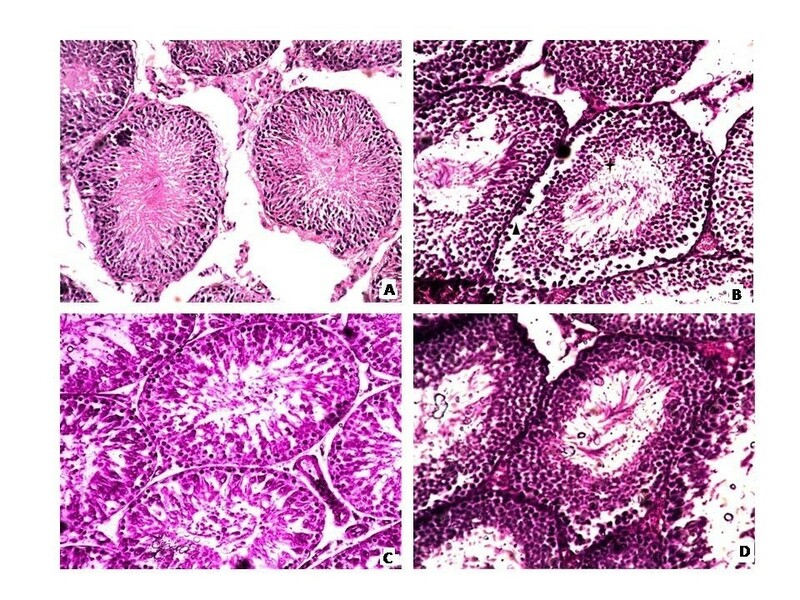 (A) Representative section of testis from the control group showing normal histology, (B) CCl4 group, (C) Silymarin + CCl4 group, (D) 200 mg/kg b.w. MLC + CCl4 group (✦) distorted and less concentration of germ cells, (▲) displaced interstitial cells away from the seminiferous tubules. Oxidative stress induced by an increase in free radicals and/or decrease in antioxidant defenses is well documented in animal model [24, 25]. CCl4, a typical toxic agent, exerts its toxic effects by the generation of free radicals. By the activation of liver cytochromes P450, CCl4 is converted into free radicals which immediately react with cell membrane . This free radical not only targets liver but it can also causes free radical generation in other tissues like kidneys, heart, lung, testis, brain and blood [27, 28]. In the current study, the proposed plan aimed to assess and examine the possibility of MLC to protect and reduce the lipid peroxidation and oxidative damages caused by CCl4 in testis tissue homogenate of male Sprague Dawley rats. The reduction of testosterone levels in serum indicates either direct effects of CCl4 at Leydig cell level or indirect effects by disturbing the hormonal environmentat hypothalamo-pituitary axis  due to oxidative trauma in CCl4 treated rats. It was reported that abnormal level of intra testicular testosterones inhibits spermatogenesis . Tohda et al. (2001). The production of testosterone in Leydig cells is stimulated by LH, which activates FSH to bind with sertoli cells to stimulate spermatogenesis . CCl4 intoxicated rats show the malfunctioning of pituitary to secrete FSH and LH indicating testicular dysfunction leading to infertility as was reported by previous results . GSH levels are dependent upon the activities of glutathione reductase (GR) and NADH . Glutathione system including GPx, GR, GST, as well as SOD and CAT represent a mutually loyal team of defense against ROS . Enhanced lipid peroxidations expressed in terms of TBARS determine structural and functional alterations of cellular membranes . In the present study, administration of various fractions of plant samples in different experimental groups improved the activities of SOD, CAT, POD, GPx, GST, GR and QR as well as non enzymatic (GSH, TBARS and H2O2) levels of CCl4-intoxicated testis towards normalcy in warfare of oxidative trauma in vivo. Hence, the present results regarding chronic toxicity of CCl4 are in accordance with previous reports [36, 37], while studying the protective effects of Sonchus asper and Launeae procumbens on testis against oxidative stress of CCl4. Present study revealed that the activities of antioxidant enzymes were significantly reduced the toxication of chemical which might be due to the presence of bioactive elements like myricetin, kaempherol, isoquercetin, hyperoside and vitexin, propagating free radicals like peroxyl radicals and converting the reactive free radicals to inactive products. It was reported that CCl4 resulted in the oxidative damage to testicular proteins in rats. Oxidative damage to proteins is very important as it can contribute secondary damage resulting in hampering the DNA repair enzymes and loss of reliability of damage polymerases during DNA replication. The DNA damage in various tissues like brain, testis and liver was reported by Manierea et al. . From the present study, it can be assumed that chronic exposure of CCl4 may cause accumulation of many toxic species in cells thus damaging both DNA and lipids. In fact, treatment with various fractions of plant samples ameliorated the toxic effects on DNA as revealed by DNA fragmentation % and ladder assay. The present study clearly augments the defensive mechanism of various samples against oxidative stress induced by CCl4 and provides confirmation about its therapeutic use in reproductive abnormalities. Previous studies on histomorphology of testis showed shrinkage of the tubular diameter and testicular atrophy leading to degenerative changes in the germinal epithelium  after exposure to toxic chemical. Similar destructive effects were also accounted in CCl4 treated groups. The CCl4 challenge revealed testicular destruction and degeneration in histological architecture like that of profenofos that was recorded by Moustafa et al. who represented damaged columnar epithelial layer, vacuolated spermatogonial cells, oedematous alterations in the seminiferous tubules and extra elongated Leydig cells. Data of the present study revealed that CCl4 may hamper continuing proliferative behavior of testicular cells thus obstruct reproduction. Deformities in spermatogenesis and partial degeneration of germ and Leydig cells have been displayed by CCl4-treated rats. However, groups administered various fractions of plant samples in different experiments demonstrated a quality active spermatogenesis, thin basement membranes and normal seminiferous tubules in most of the part of testis. Same histopathology was noticed by Manjrekar et al. , while evaluating the protective effects of Phyllanthus niruri Linn treatment on testis against CCl4 intoxication. This paper is in continuation of our previous studies Sahreen et al. in which hepatoprotective effect of methanolic extract of leaves were asasessed. It can be concluded from the current study that bioactive components of MLC especially flavonoids (myricetin, kaempherol, isoquercetin, hyperoside and vitexin) have the ability to recover the metabolic enzymatic activities and repair cellular injuries, thus providing scientific evidence in favor of its pharmacological use in testicular dysfunctioning. SS made a significant contribution to acquisition of data, analysis, drafting of the manuscript. MRK and RAK have made a substantial contribution to conception and design, interpretation of data, drafting and revising the manuscript for intellectual content. All authors read and approved the final manuscript.